We’re always looking for new recipes and kitchen challenges. Whenever we’re buying groceries, we’re always on the lookout for new produce or ingredients to try. 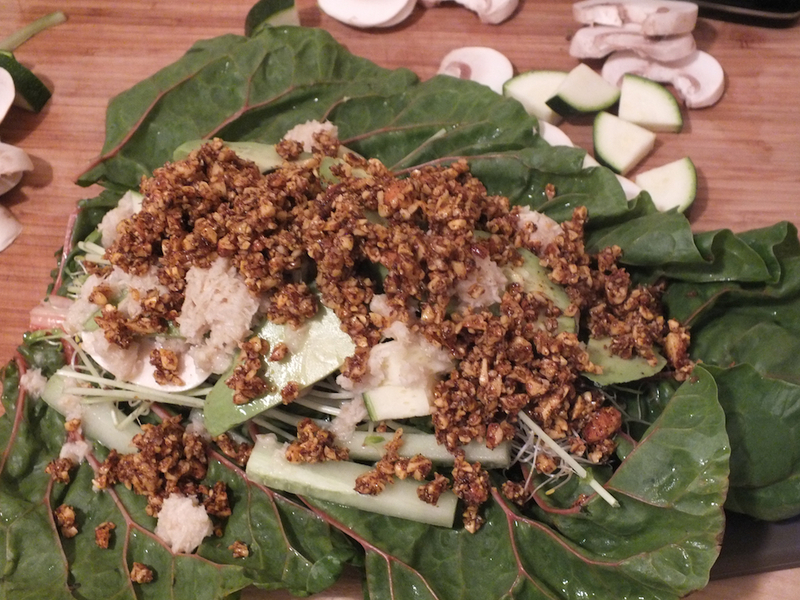 At the beginning of the year, we made a resolution to eat more raw meals. As it is, we eat our fair share of vegetables and a wide variety of them at that. But there is always room for improvement. 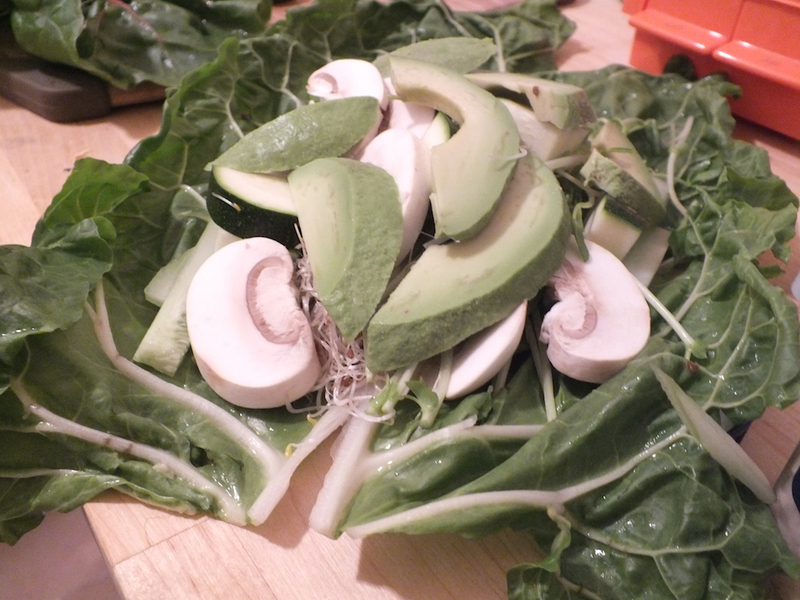 Raw veggies retain all of their inherent nutrients, whereas cooking often depletes these benefits. 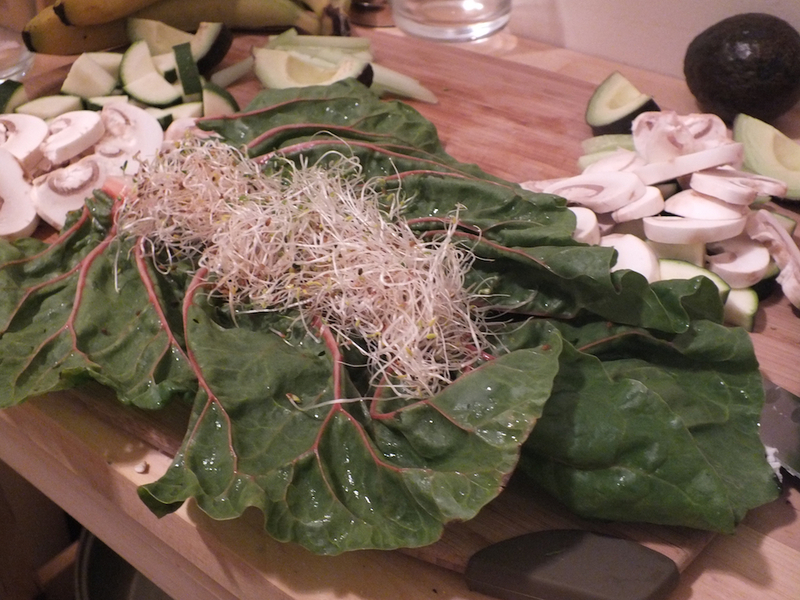 We challenged ourselves to eat raw meals at least 4 times per week for dinner. The most obvious choice, salads, quickly got boring. So I started browsing and pinning to see what all was out there. [The Interweb rarely fails me.] 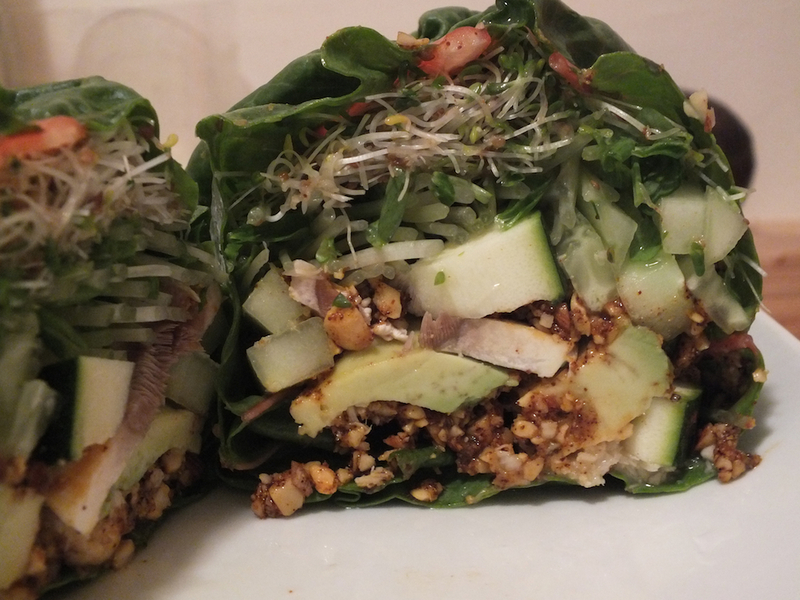 I’ve seen raw recipes floating around from time to time, but when I actually took the time to delve into the world of raw, I was amazed at what I found. 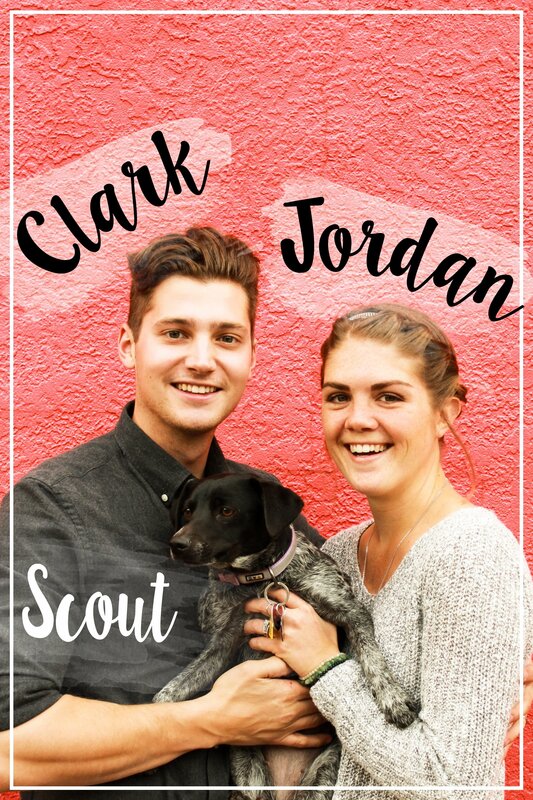 Around this same time, we got Netflix and started watching food-u-mentaries, if you will. Fat, Sick, and Nearly Dead, Food Matters, and Hungry For Change were the main ones that we enjoyed. We were well aware of the need to eat healthy foods and incorporate lots of produce. These movies stressed the importance of eating a plant-based diet. While we watched them, and afterwards, the facts and views in the movies led us into some fantastic discussions. So we shifted our goals a bit. We decided to commit to an 80/20 diet. For us, this means 80% of what we eat will be raw and/or vegan, and 20% will be cooked food or animal protein. Our diet prior to this consisted of animal meat several times per week; we had chicken for dinner most nights. As with anything else, this will be a gradual process that will involve lots of learning. We want to eventually eliminate all meat from our diet. 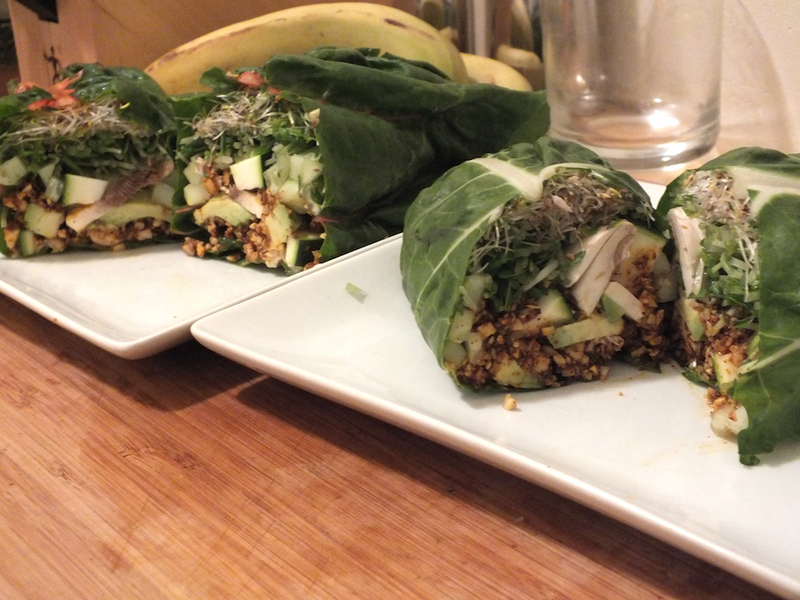 One of our first raw dinners was the big, beautiful burrito below. This recipe is simple to make and easily customizable depending on your tastes/what’s in your fridge. These quantities make enough for 2 large burritos, so be sure to half it if it’s just you eating! 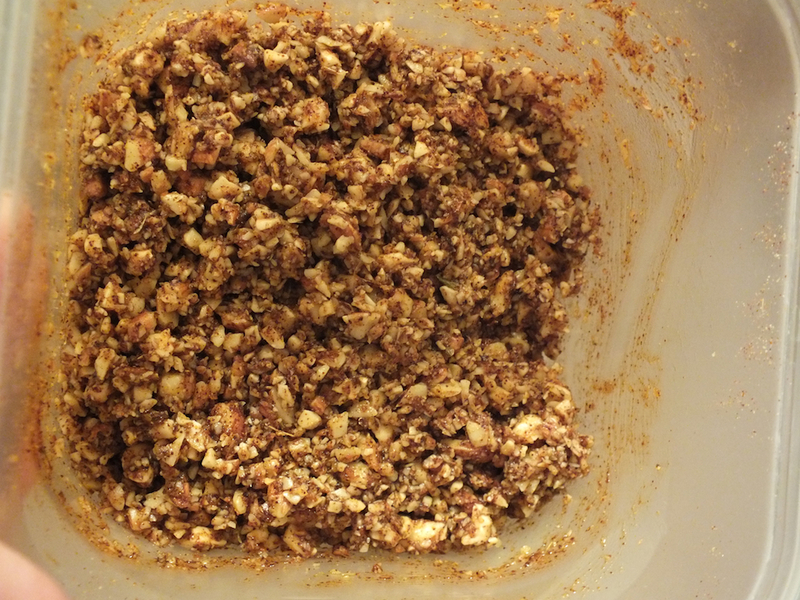 Chop your nuts in a food processor until they are finely chopped or crushed. Not pulverized or powdered into flour. That’s when you’ve gone too far. Add 2 T cold pressed olive oil and the above seasonings. Place it into the refrigerator to marinate while you prepare the rest of the ‘rito. 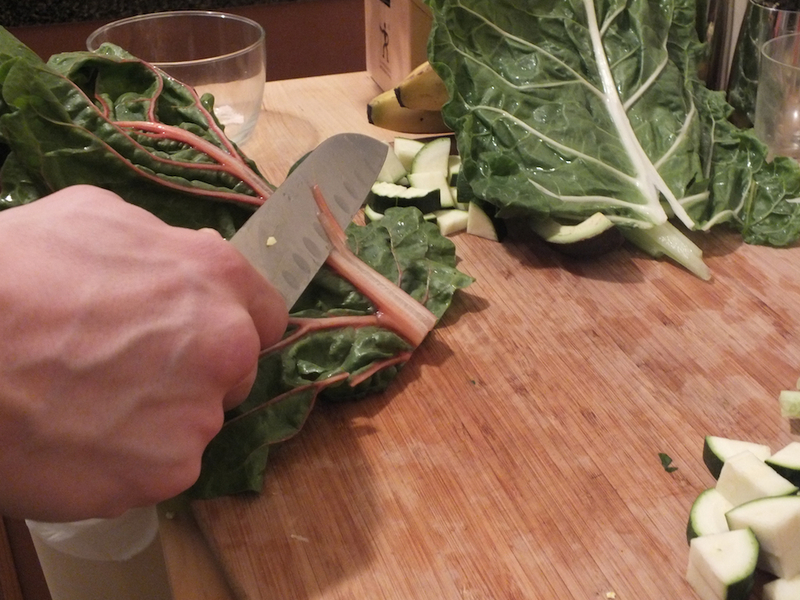 Prepare your various veggies by cutting/chopping them as follows. 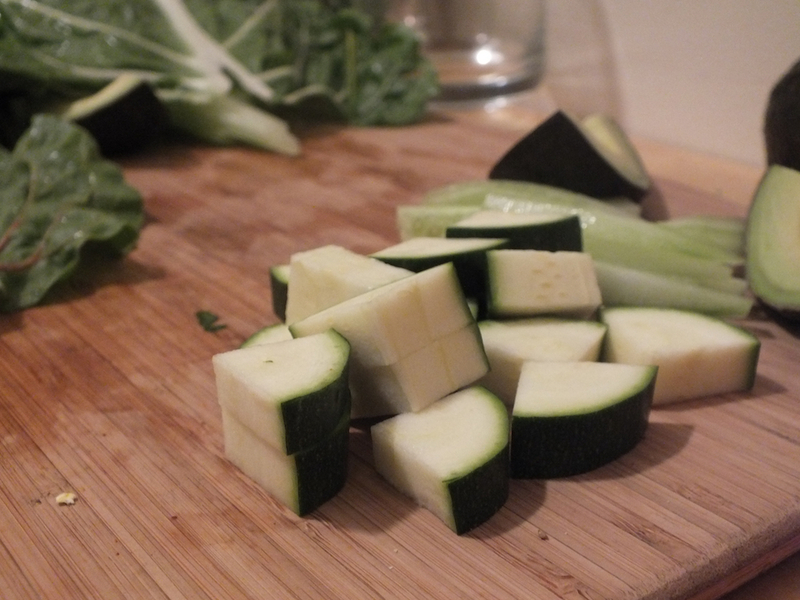 Zucchini: chopped into large, but bite-sized hunks. Cucumber: cut in half, then make long slices, about as thick as your pinky finger. Mushrooms: 1/4 inch slices. Avocado: cut in half and then slice into 1/4″ pieces. The variations in shape and cut plus the different textures of the veggies makes for a more interesting burrito. 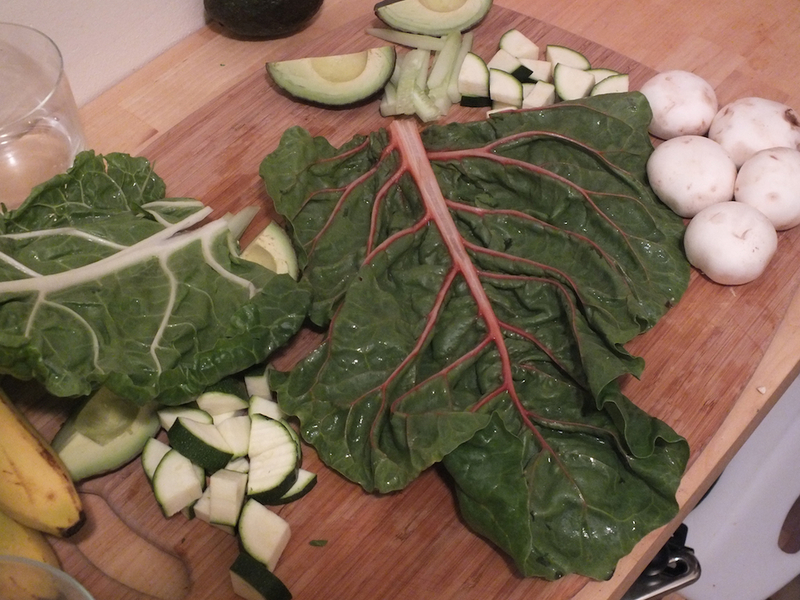 Lay the chard leaf [aka tortilla] flat with the stem facing up. Using a knife, carefully shave away the thick spine. This trick will make your burrito easier to roll. When you’re ready to fill your burrito, start off with pea shoots and alfalfa sprouts. These add a delightful crunch. Follow with zucchini, then cucumber, then mushrooms, then avocado. Add about a tablespoon of horseradish. For the grand finale, scoop your “taco meat” onto the pile of awesomeness you’ve just created. Now for the hard part: rolling. Rolling is an art form. It takes years of practice to perfect the technique. JK – no one is good at it. Our advice? 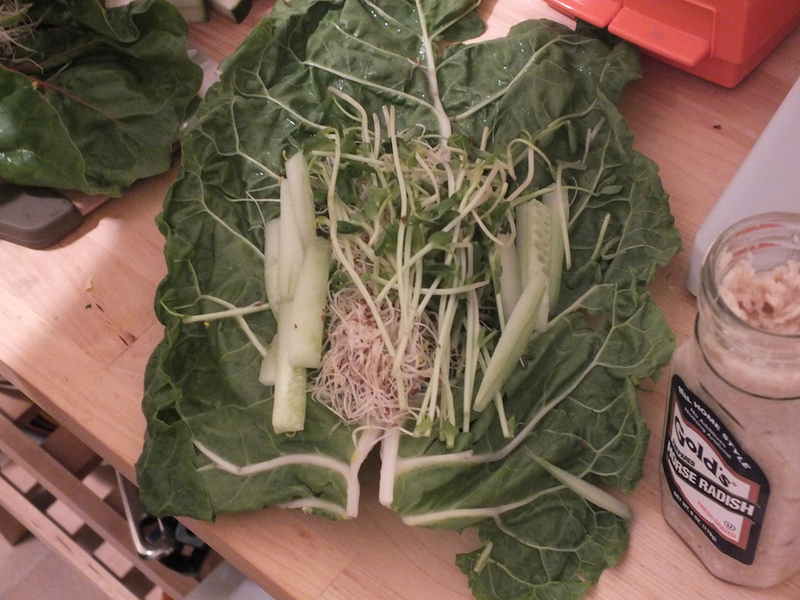 Lift both sides and try to get all the ingredients to the middle of the leaf. Then, pull one side to the top, fold the ends in, and roll. Do it gently so the leaf doesn’t rip. If it does though, it’s not the end of the world. Just salvage it as best you can. Once it’s satisfactory, cut it in half and marvel at its beauty. Then, demolish it. I luv all your dishes. This one stands out! I once visited Lebanon and my friends took to me a restaurant, Cafe Sho, where they served a similar dish to this one. However, the only difference was that they used rice paper instead of Chard leaves for wrapping and there was a slice of Raw Tuna inside. Thanks for the suggestion – we’ll work some higher protein dishes into the rotation! We used rice paper for our Spring Rolls and they worked great. We’ve never tried Lebanese food but it’s on our bucket list.